Jessalyn Rohs is an Artist and Printmaker currently living in Edmonton, Alberta. She is the illustrator of two adult colouring books YYC Colours, and Welcome to Canadream. 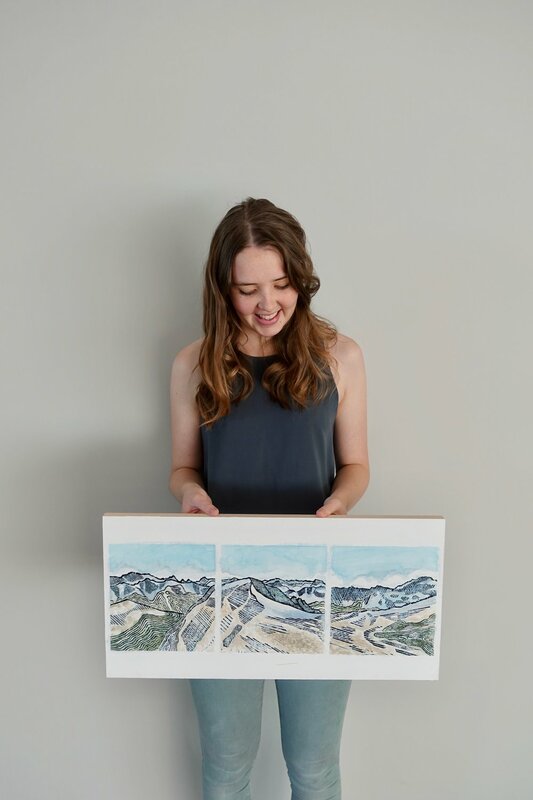 Jessalyn’s art is inspired by the rocky mountains, and her favourite places to paint are alpine meadows, while taking a break during a long day of hiking, or in her apartment wearing fuzzy socks and TV playing in the background. She began printmaking in February of 2017 and fell in love with linocut prints and oil based ink. Each print is uniquely painted with liquid watercolours, making every piece truly an original.You can find her apartment walls covered in prints hanging on clotheslines, as she impatiently waits for the ink to dry. You can contact Jessalyn with requests for commissions for the holiday season until November 15, 2018.